During Unlock the Past's history and genealogy Expo in Brisbane this week, a friend sent me this email: "The propaganda of excitement in some tweets, blogs etc is anything but convincing. Excessive use of words like 'fantastic', 'amazing', 'fabulous' and 'brilliant' really puts me off. Are the writers being paid to rave on like that?! I challenge you to write an honest, warts-and-all report." I have previously talked about why I like genealogy conferences. During the Expo I heard many people say that they were having a great time and learning a lot. One lady even met two relatives whom she didn't know existed! Everybody enjoyed seeing old friends and meeting new ones. But were all the exhibitors happy? I suspect not, because attendance numbers were disappointing. Could local societies have done more to promote the event? I don't know. If I could turn back the clock, would I personally change what I did at the Expo? Definitely! A few weeks ago I emailed hundreds of my clients in southeast Queensland and northern NSW to tell them about the Expo. Many replied that they would have come on a weekend, but not Monday to Wednesday because they work full-time. On Monday evening the Expo was open until 9:15 so people could come after work; but as far as I could tell, not many did. Maybe the weather had something to do with that. (Brisbane in June/July is usually gloriously sunny, but unfortunately this week was wet and cold.) Tuesday and Wednesday were busier, but some exhibitors still spent a lot of time trying to keep warm while waiting for people to visit their display. The venue was better than I expected. The hall was set up with lots of space between the exhibits, and people could move around without bumping into others or knocking books off tables. With a large room and a high roof, noise levels were not a problem, so (thankfully) I did not lose my voice! I may have been busier than some exhibitors because my table was at one end of the popular Research Help Zone. I thoroughly enjoyed helping people with their research problems, but it was quite challenging at times. My area of expertise is Queensland records, but about 30% of the questions I was asked involved New South Wales or Victoria. Having done some research in those States, I could at least offer a few suggestions and recommend various indexes, Web sites and professional genealogists. Occasionally I could send the enquirer around the corner to Kerry Farmer or Carole Riley, but they had other commitments most of the time. Being on my own was not easy. Kerin Stinear and Sharn White (bless them) came over occasionally and kept an eye on my table while I dashed out for a bathroom break or a toasted sandwich. When it was time for my own talk, I had to politely abandon a lady who had just arrived with a long list of questions. In the lecture room, after I found my Powerpoint presentation on the computer, figured out how to turn on the projector and asked someone to put batteries in the remote control, I finally got underway. By then I was feeling a bit rattled, and my presentation of 'Black Sheep and Vanishing Relatives' was not up to my usual standard. I don't know about the other exhibitors, but for me, from a business point of view, the Expo was not a success. With so many stands selling so many interesting items, competition was tough. I barely sold enough books to cover expenses for the three days. From a personal point of view, I did enjoy the Expo, but I would have enjoyed it a lot more if I had not been an exhibitor. I bought a Gold Ticket because I wanted to attend a few talks, but in the end I only made it to two. I could not bring myself to walk away when people were waiting to ask me questions! The talks I did hear (both by Audrey Collins) were entertaining and informative. Audrey said that her blog, The Family Recorder, will soon have a page with links to hard-to-find UK newspaper sites. I envy those of you in southern States who can attend Audrey's seminars in the next few days. 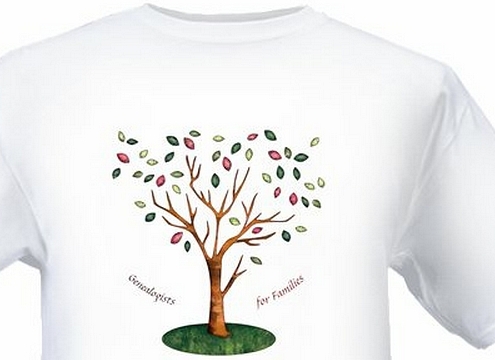 Last but not least, a message for members of Genealogists for Families: If you meant to buy a team T-shirt but forgot, please email me! Great post. Ah well...I have been known to be somewhat exuberant in my descriptive powers so perhaps I am to blame. I suspect that the Expo didn't get the crowds that they hoped for but it was the first one in Brisbane I think yes? And yes, I think the weather didn't help or the timing. A weekend may have been better. Maybe even a different location would have been better. I loved it being where it was because it took me five minutes to get home. However I think for a lot of my friends who live on the north-side, it was a bit of a trek into the wilds of the western suburbs of Brisbane! Some complained about the difficulty of locating parking - even though there was plenty..you needed to be in the know as to exactly where it was located. I work full-time so only managed to make Monday night and because I was on duty at the QFHS stall didn't get to any of the talks. Therefore I am not qualified to comment on the calibre of the speakers or their talks though I am very sorry I missed them. But I am always surprised (I don't know why) at how delighted I am to meet other fellow enthusiasts who are so truly generous with their time and knowledge. It is really heartening. So I recommended the Expo on that level - that it is such a pleasure to get out and connect with people in the real world and not just in the virtual space. I wasn't paid to wax enthusiastic...I just thought that anyone who did have the opportunity or time to go would have had a reasonable smorgasbord of experienced practitioners and organisations/companies from which to draw inspiration/advice. Next time I'll have to remember to tone it down in order to sound convincing. I quite agree Judy about having breaks scheduled. No breaks means people have the chance to see max talks, the flipside was that people couldn't chat/eat/etc without giving up on talks. Also as you say it meant it was a lot more hassle for exhibitors, probably without sufficient financial payback. I think not having breaks would have made a difference in terms of people's time at the exhibits too. So yes, a lunch and a tea break of even 15 minutes, or a slightly longer gap between talks would have been helpful. I didn't envy you sitting in the hall as it was freezing though the space was good. I really enjoyed myself but then I hadn't expected to be there at all ;-) The weather was a nightmare, and of course is now beautiful! Thanks for your comments, Pauleen. I am also receiving feedback by email, and apparently some folk who (understandably) chose to go to every session of talks did miss out on a proper visit to all exhibits plus the Research Help Zone. By 'proper visit', I mean being able to spend enough time with a particular person (notably Kerry Farmer and Eric Kopittke, who were in great demand).